Chateau Lagorce gets a kitchen makeover!!! Although Chateau Lagorce has welcomed many a happy client over the past few years, with not one complaint about the usability or cleanliness of the kitchen, we felt that the kitchen was getting a little too hard to clean on changeover days. 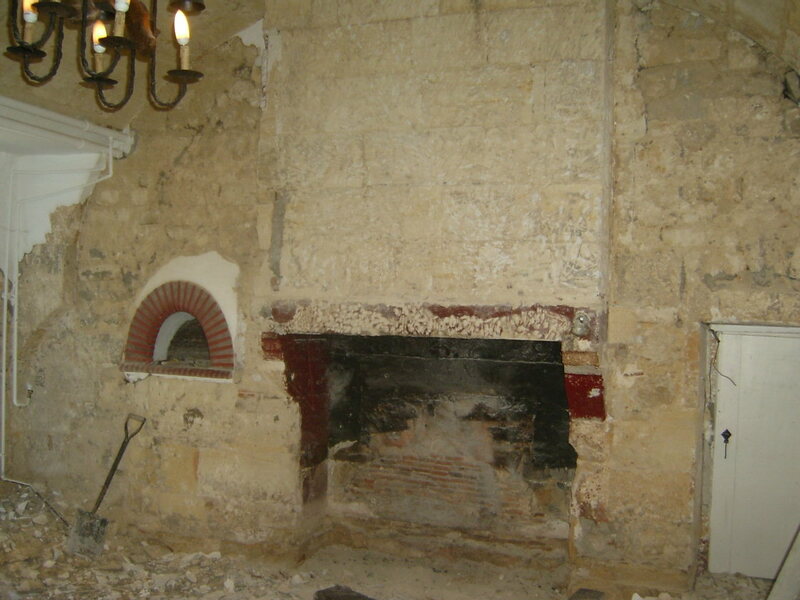 Hence the decision was taken in December 2008 that in early 2009 we would renovate the kitchen to bring the kitchen up to date, make it easily cleanable yet keep an ‘old chateau’ look. Work is now well underway, with all the cement already off the walls, and the beauty of the local stone shining out, our next step is to set a new concrete floor base, ready for the traditional hand made ‘carreaux de gironde’. Following this the stone walls will be pointed and new kitchen units will be fitted, the new kitchen will comprise of three ovens, a built in microwave, professional dishwasher, two hot plates and a professional fridge. Along with renovation the newer aspects of the kitchen (units, cookers etc) some of the more ancient features are getting a little attention eg. two two hundred millimeter tubes have been installed to bring the fire fresh air, to drastically reduce draughts created by lighting a fire.These renovations have led to some interesting discoveries. The sink was not just a stone lintel filled with cement, the sink was in fact a huge carved slab of stone. Whilst renovating the chimney we found that the small bread oven used to be a huge bread oven(black lines were found in the stones), unfortunately ninety nine percent of the old oven was demolished, so we can not revert back to this original layout. More information will follow once the renovation has been completed.